If you have been to a physical therapist for treatment, you may have noticed a few different letters after your therapist's name. What are those initials after your physical therapist's name and what do they mean? 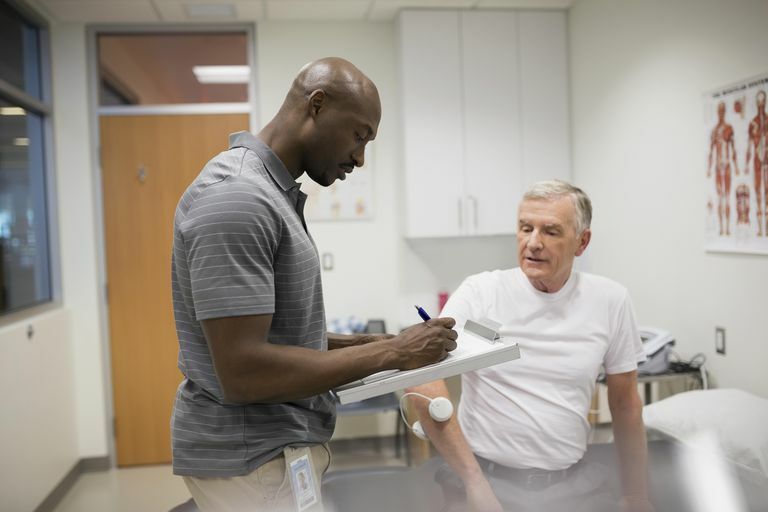 Your physical therapist is a credentialed healthcare professional, and there are certain requirements that he or she needs to do to identify himself as such. The American Physical Therapy Association (APTA) requires that physical therapists follow specific guidelines when identifying his or her credentials. That way, there is no mistake as to the professional credentials of your PT. Currently, a PT should be identified by their name, their profession (in this case 'PT'), and the highest degree obtained. If your physical therapist has a clinical doctorate degree, he will sign his name, and then write "PT, DPT" after his name. For example, I have a Master's Degree in Physical Therapy, so I should be identified as Brett Sears, PT, MS. Some physical therapists sign their notes and other documents with just their name and then the letters PT to save time, but officially, they should include their highest degree earned and other post-graduate certifications. CCS-Cardiopulmonary Clinical Specialist. These physical therapists are experts in assessing and treating patients with heart and/or lung problems and may work in cardiac rehabilitation centers. ECS-Clinical Electro Physiology Specialist. These specialists can conduct electromyographical and nerve conduction studies to help determine the cause of specific muscular and nerve problems. GCS-Geriatric Clinical Specialist. These PTs work with older persons and are experts in helping to improve functional mobility in this specific population. NCS-Neurologic Clinical Specialist. Neurologic specialists work with patients who have neurological problems such as stroke or Parkinson's disease. OCS-Orthopedic Clinical Specialist. Those with the "OCS" are specialists in working with patients with musculoskeletal problems such as back pain, hip pain, or muscular strains. PCS-Pediatric Clinical Specialist. These specialists work with young patients with various diagnoses that may limit functional mobility. SCS-Sports Clinical Specialist. Sports specialists are experts in the treatment of injuries of athletes. They also work with athletes to help prevent or decrease the risk of injury. WCS-Women's Health Clinical Specialist. Physical therapists with the women's health certification are experts in evaluating and treating women with conditions specific to their health. These often include issues like incontinence or genitourinary conditions. As of June 2015, there are over 18,000 clinical specialists recognized by the ABPTS. To become certified, your PT needs to pass a rigorous examination process. Certification lasts for ten years, and then re-certification is necessary. Some physical therapists earn post-graduate certifications in certain treatment methods or specialties. For example, physical therapists trained in the McKenzie Method of Mechanical Diagnosis and Therapy include extra letters after their name. Those certified in the McKenzie Method include "Cert. MDT," while those who have earned the diploma (the highest level of the method) use "Dip. MDT." Clinical hand therapists may treat people with tendon issues of the hand, finders, and wrists. They may treat people with carpal tunnel syndrome or after a Colles' fracture. These specialists use the term "CHT" for clinical hand specialist. Physical therapists also treat patients with swelling due to lymphedema of the upper or lower extremities. They may use the initials "CLT" for certified lymphedema therapist. If your physical therapist is a certified strength and conditioning specialist with the National Strength and Conditioning Association (NSCA), he or she may use the letters "CSCS" after his or her name. Other therapists may become in using kinesiology taping techniques, and they may use the letters "CKTP" as a certified Kinesio taping practitioner. The American Physical Therapy Association also recognizes therapists who have helped to progress the mission of the association through his or her lifelong work. The letters "FAPTA" indicate that your PT is a Catherine Worthingham Fellow of the APTA, the highest honor bestowed upon members of the organization. Your relationship with your physical therapist should be a therapeutic alliance, with the both of you working together to help you move better and feel better. This means you may have questions to ask about your treatment. It also means that if you're unsure about the letters after his or her name, just ask. There are so many different clinical specialties and post-graduate certifications that there is no way to memorize all the designations. So, if you are wondering what those letters after your physical therapist's name mean, just ask. Engaging in the healthcare system can be confusing with so many different doctors, nurses, and para-professionals working to help you live a healthy life. In the physical therapy world, it can be difficult to know who is who. Having letters after our names helps people identify our roles and our degrees held. By understanding the letters after your PTs name, you can be sure to have a successful rehab experience.